Had some good comments around optics in the prior post, and Ryan shared his thoughts on optic choices, so I thought some follow-up discussion was in order. My current optic is an Aimpoint PRO. It's been very good, zero issues, and a solid choice for a $400 red dot w/ mount. Great budget conscious choice, but the only real reason that I can discern to run a PRO is if you can't afford the $200-ish extra for a H1, T1 or T2 Micro Dot. Budget constraints aside, the Micros do the same thing for substantially less weight. The PRO weighs 11.6 ounces, where a Microdot weighs something like 5 ounces, depending on your mounting option. That's a nontrivial weight difference - nearly half a pound of excess when running the PRO. Weight isn't of course the be-all, end-all, especially on a weapon platform that is fairly lightweight to begin with. But, I am really enjoying the light weight and balance of my new ELW / KMR13 upper. Having a fatty optic on there just seems non-congruent. A micro dot would be soooo nice -- and it seems like a bunch 'o of today's top carbine trainers are running a pretty similar set up, too. Travis Haley, LAV and others. One of the commenters mentioned that variable power 1-6x magnification scopes are all of the rage now. The Vortex Viper HD seems to be the go-to recommendation, but it's also $1400. Trijicon has a similar optic in a similar price range, as does Leupold. So, off hand I replied that a $1000 optic wasn't in the budget. Subsequent comments pointed out that there were more cost-friendly variables out there. Primary Arms has a 1-6x for under $300...but honestly, I wouldn't put a Primary Arms on my go-to, primary defensive rifles, and I think PA would agree with that--they've put notes on their optics that they are for training purposes / not patrol in the past. Vortex and several others have 1-4x optics at around $500. Vortex also just announced their 1-6x Strike Eagle which would probably be at the top of my list to check out. A variable optic has a lot to like about it - red dot like performance at 1x and the ability to zoom in for distance shooting. 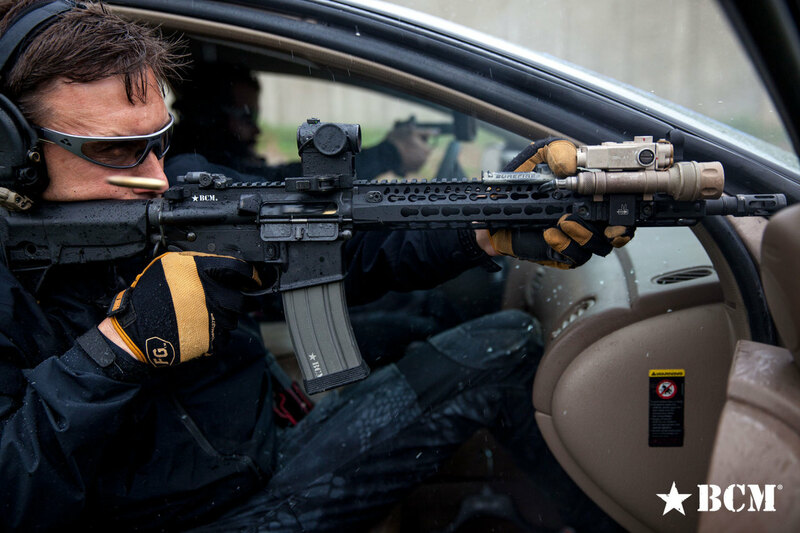 The 'recce' - shorter, railed carbine with a variable power optic - has become the go to choice for a versatile, do-all AR. Variables also have a big downside - weight - with a mount, you're talking somewhere around ~1.5 pounds extra. That tradeoff can often be worthwhile, sometimes not. Personally, I don't have ready access to a range that goes much beyond 50 yards. When I lived in rocky mountain west, long range was the norm - heck, I lived around the corner from a range that went out to 400 yards. In the heavily forested south east, I'd have to drive an hour or two to get to a range that was 100 or 200 yards. And even then, 200+ yards isn't that hard with a red dot. You won't get tiny groups like you can with a magnified optic, but combat effective ain't hard. And there's also the point things would have to be waaaay down the crapper for me to be taking potshots at bad guys out at 300 or 400 yards. So, for my situation and for this particular lighter-weight, go-to defensive carbine, I'm feeling like a variable would be more than what I need and more weight than I want to strap onto the gun. Of course, minds can always be changed and switching out optics isn't that tough. But for now, I'm hunting for deals on an Aimpoint Micro - if anyone has any screamin' deals, let me know.